Charles Cattermole was the son of R. Cattermole and the nephew of G. Cattermole whose subject matter he adopted. 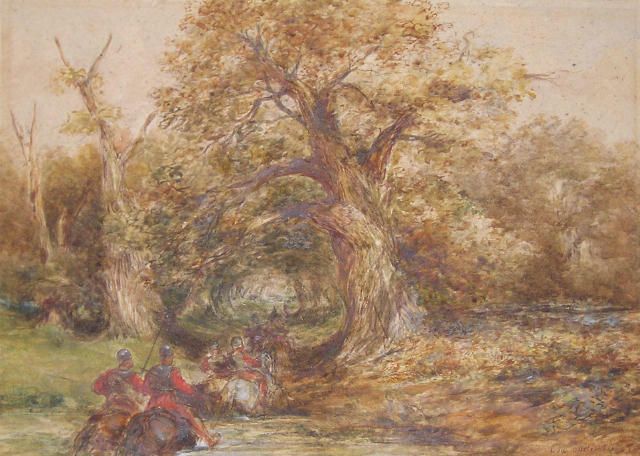 He exhibited from 1858 and was elected Associate of the New Watercolour Society in 1863, rising to full Member in 1870, serving as Secretary for many years. He was also the Secretary of the Artists’ Society at Langham Chambers. He exhibited at the Royal Academy, the Royal Society of British Artists, to which he was elected Member in 1876, the Royal Institute, to which he was elected Associate Member in 1862, rising to full Membership in 1870, the Royal Institute of Oil Painters, to which he was elected Member in 1883, the Royal Society of Artists Birmingham, Glasgow Institute of the Fine Arts, Walker Art Gallery Liverpool and the Suffolk Street Galleries. Examples of work by Charles Cattermole are in the British Museum, the Victoria and Albert Museum, Leicester Gallery, Paisley Art Gallery, the Royal Shakespeare Theatre Stratford and Sydney Art Gallery.